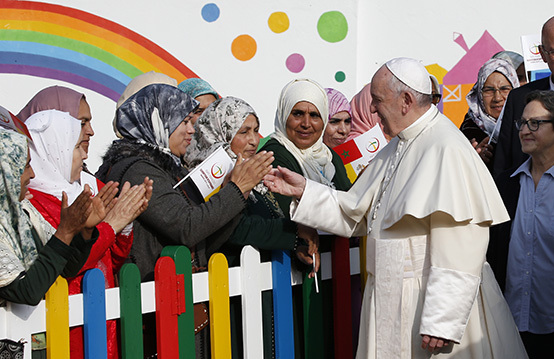 Pope Francis’s words came as he was addressing a group of migrants at a center run by the international Catholic charitable organization Caritas, during the first day of his visit to the Muslim kingdom. The pontiff also praised a recent Global Compact on safe, orderly and regular migration approved in Marrakech last December during a United Nations-sponsored Intergovernmental Conference. During the past year, Morocco became a key destination for sub-Saharan African migrants seeking to reach Europe through Spain, which is seven miles away across the Mediterranean Sea. Most travel in rubber boats or use car tires as life preservers. The latest influx has strained Morocco’s resources and fueled anti-migrant sentiment in Spain, where welcoming centers have collapsed in many cities, leading civil authorities to abandon recently-arrived people in the streets. Collective expulsion, the pontiff said, is unacceptable. “Here, too, it seems necessary to pay particular attention to migrants in situations of great vulnerability, [including] many unaccompanied minors and women,” he said. The promotion of migrants, the pope argued, begins with the communities of origin, where the right to leave must be guaranteed, as the right not to be forced to migrate. Pope Francis was welcomed at the Caritas center by Archbishop Santiago Agrelo, a Spain-born prelate who heads the archdiocese of Tangier in Morocco. Yet it’s important to remember those who don’t have the papers, because they have “nothing,” and are often defined as illegal or irregular.